Local delivery fleets will have the option from next year of an all-electric powertrains for Ford Transit models complete with built-in fleet analytics. MIRA Technology Park based fleet efficiency and emissions improvement specialist, Lightning Systems, will introduce a zero-emissions full electric system for the Ford Transit passenger wagon, van, cutaway and chassis cab models. The LightningElectric zero-emissions package will be available for a range of Ford Transit models as part of Ford’s eQVM (electrified qualified vehicle modifiers) programme. The electric system will go on sale in early 2018 for heavy-duty Transits with a 10,360-pound gross vehicle weight rating (GVWR). The system will be extended to additional Ford Transit models later in the year. Conversions and service are performed by Ford QVM-certified fitters and dealers around the world. 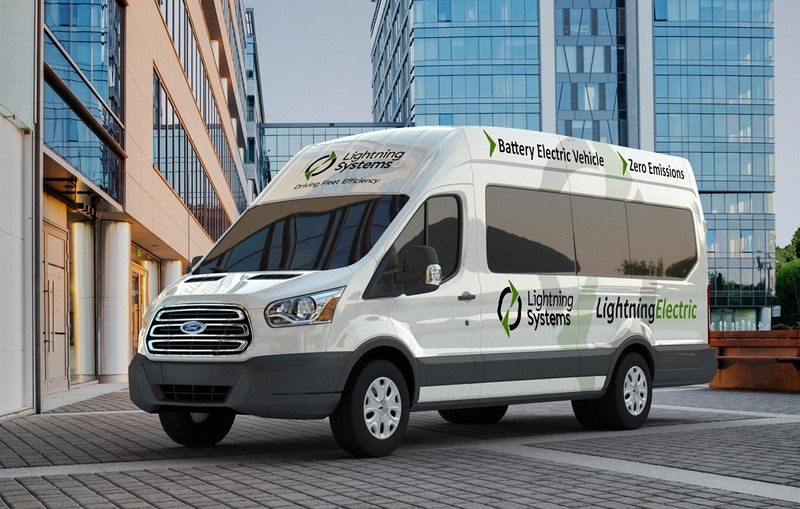 Lightning Systems worked with American firm, New Eagle, on the design of the LightningElectric system for the Ford Transit. New Eagle specialises in mechatronic controls, which are the electronic brains that drive mechanical systems, and is a specialist in the application of model-based design into real-time embedded systems in the fields of autonomy, electrification, hydraulics and engine systems. Depending on battery option and drive cycle, LightningElectric will have an electric range of up to 125 miles, and a payload capacity of up to 3,500 pounds. Ford Motor Company’s vehicle warranty covers vehicles with the LightningElectric upgrade and Ford Motor Credit financing is available. Installation can be completed in just hours by certified installers. Featuring a volume-production ready high-voltage lithium battery pack, LightningElectric will accommodate full charging overnight with Level 1 and less than three hours for Level 2 charging. Earlier this year, Ford named Lightning Systems as one of the first to achieve eQVM status (Advanced Fuel Qualified Vehicle Modifiers) for its LightningHybrid system, a hydraulic hybrid energy recovery system that offers 50 percent NOx reductions and up to 25 percent fuel savings for urban drive cycles. Applications include delivery trucks, shuttle and paratransit buses, refuse trucks and rear-engine transit buses. The system is available now, worldwide on more than 25 platforms. Both the LightningElectric and LightningHybrid systems will be certified by Ford’s new eQVM programme. The programme helps fleet and commercial customers meet their unique and specific needs for durable, reliable advanced technology work trucks that retain the original powertrain warranty and utilise Ford’s dealer service network. LightningAnalytics, a new cloud-based analytics system that provides drive, route and predictive vehicle health scoring for maximum range and efficiency, is included on every LightningElectric vehicle. The analytics system provides fleets with real-time information to operate their fleet at peak efficiency. LightningAnalytics also is available with the LightningHybrid system, and is available as a standalone product with a variety of modules to provide efficiency solutions to fleets.